PA-13 Roundup: Hardball, Guns, Auto Workers and… Deer Meat? 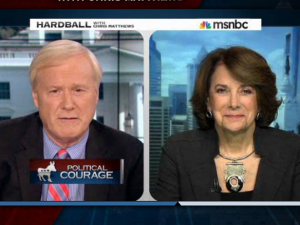 Fresh off the heels of her announcement that she will be running to fill the soon to be open seat of Pennsylvania’s Thirteenth District, Margolies gave her first national interview last week to MSNBC’s Chris Matthews. She drew equal time with Rhode Island Gov. Lincoln Chafee. Matthews, a Philadelphia native, gaved Margolies a extremely warm welcome, going as far as to call her “my hero”. When asked by Matthews why she sought to return to Congress after a nearly twenty year absence, Margolies responded that she felt she had never truly left public service and that she had kept fighting the same battles throughout her career. She did note, though, that part of her desire to return was that “I just think we, women, bring a different vision, view to the table”. Unfortunately for Dr. Valerie Arkoosh, who filed to run last month, Matthews didn’t seem to know she was in the race. Margolies made no attempt to correct him. But the biggest question remaining about the 13th district is this: will it contain any Clintons in the next 12 months before the primary? And will the former President stop in for a cameo and TV ad, or a fundraiser, too? She also launched a new website and has the endorsement of the Women’s Campaign Fund, one of just three congressional endorsees in the nation as of today. State Sen. Daylin Leach (D-Montco) scored an early union endorsement from the United Auto Workers. And Leach continue to attract love from the netroots like a liberal magnet. Boyle also held a fundraiser last week with the help of Congressman Bob Brady (D-Phila) that saw over 250 people attend according to the Philadelphia Public Record. The event was also a chance to showcase Boyle’s vast array of union support, as he has already secured the endorsement of the Pennsylvania Teamsters, the Fraternal Order of the Police, and several other local union chapters. His campaign said John Dougherty of IBEW will be spearheading a fundraiser with other labor leaders on June 27.